According to Net Applications, smartphones and tablets now generate 8.2 percent of US web traffic. That means it's essential to have an effective mobile website in order to stay competitive. 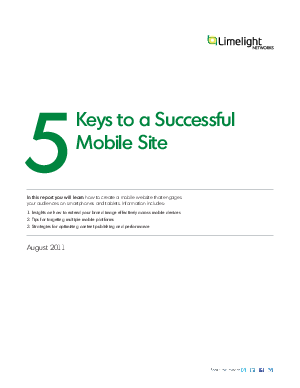 5 Keys to a Successful Mobile Site will show you how to create mobile web experiences that are branded, content-rich, and satisfying whether consumers access them at home, in the office, or on the go. The mobile web is everywhere. Make sure your brand is there too.